In two earlier posts, I examined the sacraments of Baptism & Chrismation/Confirmation. I turn now to the 3rd gate, Penitence. At its’ heart, penitence is the act of acknowledging egoistic needs fulfilled at another’s expense. It is an act of repentance for our addictions of thought, feeling, and action that separate us from others, the truth of our greater Self, and, thereby, from the sacred. Penitence restores a 7th sense after the physical five of sight, sound, taste, touch, smell and, adding a 6th, intuition. The 7th sense is keener awareness of one’s spiritual station and place on the mountain path the leads to the Cosmic Heart, Divine Union, authentic compassion, or agape, enlightenment, or satori. Penitence is the corrective whereby we acknowledge the inner shadow and reintegrate it into our persona. It is a process of spiritual re-tuning, atonement for blindness of spirit, and remembering the once and future Incarnation. It was once an ecclesiastically richer experience than it has become. In our times, the power, grandeur, mystery, and depth of this sacrament are leaner by virtue of the march of post-modern appetites for instant gratification, and a sense among many that it is somehow anachronistic, and no longer either necessary or relevant. At the Mass, one can simply take part in the collective prayer of confession before the communion and all is forgiven, so why submit to this added, optional (if recommended) ritual. In time, social ritual dominates and obscures the mystical interior. What never changes, however, is the meaning sealed within it by centuries of contemplative practice and mystical experience. The esoteric significance is always awaiting the moment of re-enchantment inside of us. As a young man, I recall with much delight my pre-adolescent years walking the mile or so from my grandparent’s home to the Roman Catholic church in which we were parishioners, Our Lady of Good Counsel. It was our Saturday pilgrimage. My late maternal grandfather and I would head off after breakfast to go to “Confession.” I remember taking this all very seriously, as did he. I wanted to “get it right,” and there was, of course, a formula greeting to say to the Priest that I had to commit to memory. What I liked the most about it was the anonymity. 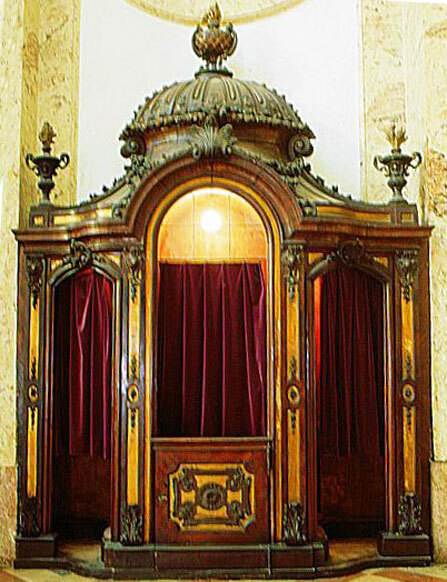 I would wait with others in the pews in prayer for a vacant confessional booth, then enter one, close the door, and wait for the Priest to signal that it was time by his sliding the small wooden partition, between his box and mine, to the left, and through which I could vaguely see him on the other side of a mesh grating, sitting in profile, and looking away from me. It was a bit like a visit to the Wizard of Oz, to be honest. There was no relationship per se. The Priest didn’t really know me and vice versa, and that was just perfect. It had an air of mystery and gravitas. It was a special moment, set apart from all others. In other words, it was a Sacrament! I felt that in confession I was speaking to a voice that was standing in for Christ. I routinely rehearsed the mantra: “Bless me father for I have sinned. It has been one week since my last confession.” After that, it was pretty much a list-wise exercise. Generally, I always began with same items: ” I lied, I cursed, I disobeyed my parents.” Dutifully, the Priest would then assign penance in the form of a certain number of “Our Fathers” and “Hail Mary’s,” offer absolution ( the next sacrament), and then admonish me to go and sin no more. I exited the booth, fulfilled the penance immediately, and walked back home feeling good as new. For a moment, I felt that I let him down by being boring, and a part of me thought it would have been better to make up a couple of really good ones: you know, something like a series of pure lust relationships. Of all my confessions, this is the one I recall the most. While it lacked the mystery of anonymity (which I still feel is an important aspect of the process), it was personal, real, inquiring, and it moved me deeply. I walked away with more questions than answers: What is a sin then if the ones I thought to mention don’t fit the definition? I obviously thought cursing, lying, and disobeying my parents were sins. But, were they? At times, cursing just feels like the right and best response. However, in social settings it comes across as inappropriate, shallow, undignified, and unrefined. But, is it sin? Well, not really. How about lying? Well, it depends doesn’t it on what one is lying about and to whom? Sometimes, the truth is an act of cruelty and violence? At other times, reframing something, or being less direct, is gracious, respectful, and diplomatic. In other instances, a lie is a crime, as when under oath. But, when is it a sin? A lie is sinful when the intent is to manipulate, swindle, deceive for personal gain or benefit, or mis-represent for reasons of expediency and personal agenda. In other words, sin is a matter of intention (whether conscious or unconscious). Thinking about my true sins, as opposed to acts of defiance, willful independence, argument, or a challenge of established rubrics of conduct or authority, is a powerful refection on my state of Mind and Spirit. It is a self-analysis. When joined by a confessor (anonymously, or face to face) the self-examination moves to another level of inquiry, precision, and clarity. When not handled in a rote formula fashion, it provides opportunity to clarify intentions of which we are unaware, and help make them conscious to better understand and master them. So far, all of this is therapeutic but it is still socio-sacramental. What then is the esoteric nature of this sacrament? Penitence begins with the choice to face our failings. Without “spinning” our acts of mind or deed, we simply speak the truth about what we have thought and done. In an authentic act of penitence, we present to a Priest that naked truth. What is critical for this sacrament to activate higher centers of consciousness is deep and real contrition. The contrite heart resolves to mend and restore balance. Simply put, to sin in this way no more. This is pre-requisite for the next sacrament, Absolution. Penitence, in itself, activates another spiritual center on the Kabbalah Tree of Life, the center associated with Mind, or Hod, הוד. Through a contrite heart, our ties to egoistic gratifications loosen, and the warm Light of the Christos becomes radiant. We experience profound refreshment. If real, it showers down on others and ourselves in the form of forgiveness. We break free of the prisons of mind defined by self-loathing, self-deprecation, guilt, anger, and angry fear. Let us orient ourselves toward the Light, see what’s real, and embrace the ALL. It is only in removing built-up spiritual plaque that Divine Light becomes radiant within us. © Brother Anton, TSSF, and The Harried Mystic, 2016. Unauthorized use and/or duplication of this material without express and written permission from this blog’s author and/or owner is strictly prohibited.